After your Databoards are built out, there's still some work to be done to ensure these reports are being used to their fullest potential. This article outlines some ways Agencies can effectively rollout Databox to their Team and to their Clients. NOTE: This article will be most valuable after your Databoards are created and sent to Client Accounts. This generates 1 centralized Streaming URL that allows you to tell a complete, comprehensive story with your data. By reducing the number of places your team and your Clients need to go to view this information, you're increasing the likelihood that they will use data more heavily in their respective roles. One of the huge value adds of working with an Agency is added experience and expertise. Simply sending the Streaming URL to your Clients does not suffice. These reports should be discussed in detail with your Clients, especially in the earlier stages of introducing them. Sharing some information on why you included the metrics you did in your reports, how you chose to combine the data, some key areas to focus on, etc. will make the reports you've created much more valuable to your Clients. Record video using Soapbox, Loom, etc. The set of reports you already created in Databox will act as the basis for what you develop moving forward and, unless you're giving your reporting process a complete overhaul, these reports will rarely have major changes made to them. Therefore, it's extremely important to make sure your Clients are comfortable with the Carousel of Databoards you built. To provide a valuable resource for your Clients, we recommend recording a video of yourself walking through the Carousel of Databoards using Soapbox, Loom, or any other recording tool. While the data on the Databoard will constantly be updated, the general structure will likely stay the same so it's important to highlight the significance of the Databoard more-so than the actual values on it. By creating a resource that shows how an expert interprets the Databoards, your Clients will be better equipped to analyze and understand the Databoards on their own. While all of the Databoards you're creating are valuable, there's typically a lot of information that's displayed. Because of that, it may be difficult for your Team to find time to analyze the entire Carousel of reports as often as they should. Creating an Overview Databoard with the most significant Metrics on it (we call these "Primary Metrics") will allow your team to stay up-to-date on the data without being buried in it. 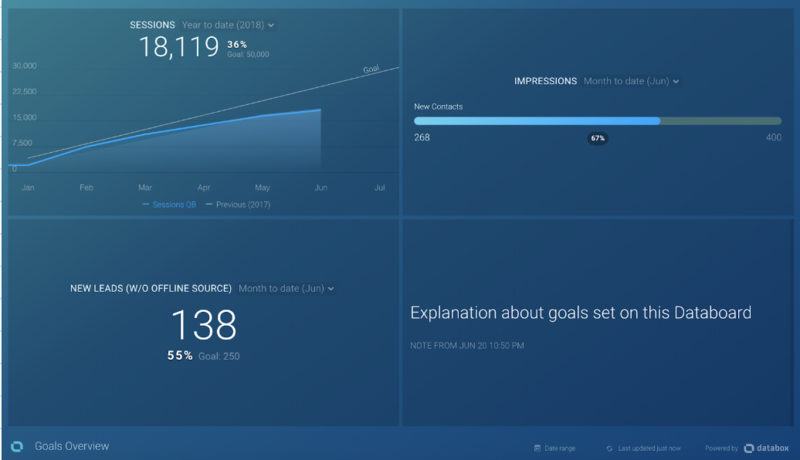 We typically recommend displaying ~5 KPIs or Goals on this Overview Databoard. Your Overview Databoard should be the first Databoard looped in your Carousel. You can then Schedule Snapshots of your Overview Databoard to come to your team at regularly scheduled times. Rather than waiting for them to seek out the data themselves, you can help make it part of their routine by delivering it to their inbox every week, day, etc. In the "body" section of the Scheduled Snapshot, we recommend including the Streaming URL so you're giving your team members one-click access to the near realtime report. In order to ensure you have the same definition of success and are working towards the same objectives, we recommend setting Goals with your Clients. Will they fire you if you bring in 100 Leads in a month, or will they fire you at 10 Leads? This is key to strengthening your relationships with Clients. Within Databox, you can set up Daily, Weekly, Monthly, Quarterly and Yearly Goals. Further, you can set individual monthly goals to help you stay on track towards hitting quarterly or yearly goals you have set. Being able to view your current progress against your goal values are important to keep momentum and to encourage your team. Scorecards send you updates on your most important KPIs through email, mobile push notification, and/or Slack every day, week, or month. By default, Metrics added to Scorecards are compared to the previous period. However, you can update them to compare to the Goals you have set with your Clients to keep them up-to-date on your progress towards reaching them.